Private Elegant home surrounded by Red Rocks. Built in 2000 and approximately 3115 Square Feet. This home has lots of extras: a media room, office and casita with private entrance. Southwestern touches make this home inviting and the most relaxing choice for that family retreat. Enter through the front gate onto the expansive deck. An abundance of seating creates the perfect setting to enjoy the private pool, a fire pit and the exquisite views of the surrounding red rocks. The Great Room features a stone gas fireplace, fans, hardwood floors, luxurious leather couch and two relaxing arm chairs. Picture windows allow the natural light to flood in to frame the red rock views. A large entertaining kitchen and combo breakfast nook with recessed lighting, knotty alder cabinets, built in wine rack, granite counters, 5 burner gas stove, sub zero refrigerator, built in microwave and a center isle with seating for two. The master suite has direct access to a private deck, log accents, fans, a flat screen TV and sitting area to embrace the captivating views. The master bathroom has a his and hers vanity, bath tub, toilet and shower. One additional queen bedroom and 1 full bath. The large office has a queen murphy bed and the home theatre room has a 60” flat screen TV and theatre seating. This home is all about privacy. The Casita has a separate entrance yet is in the center of the home. A mini kitchen with fridge, microwave, coffee maker and sink. The casita bathroom has a brass vanity sink, toilet and shower. Meet up at the end of the day or enjoy your morning coffee in the covered backyard patio. I give the members of your team the highest rating possible. We had an excellent vacation, which would not have been possible without these experienced professionals. Thank you! This was the first time I ever rented a property for vacation, so I was nervous and didn't know what to expect. I had heard good stories, and not so good stories about rental in general. I have always booked at hotels, but this time our family wanted more privacy, and a common area where we could all gather. This rental home was great and exceeded our expectations. Overall the property was great. It met our needs for the duration of our stay. The views were unreal and surrounding area was very quiet. Some minor things that could be looked at is the heating in the main bedroom made a loud hissing sound. It was hard to sleep with this noise. The outdoor fireplace also was not functioning. The fire kept going out. Maybe the propane tank was empty in which case should have been replaced prior to our arrival. Finally, when we first arrived it was not clear about the additional room across the courtyard. We only discovered it after realizing there was a bedroom missing in the main house. Everyone was both friendly and professional. 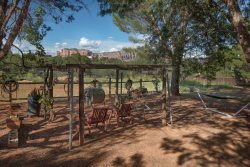 We have been renting Sedona homes for the past ten years. This home was among the best that we have experienced!